Larger and easier to handle! 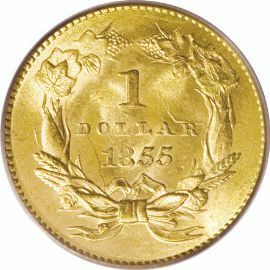 The Indian Gold Dollar from 1854 to 1856 was the second type of this denomination made at the U.S. Mint. They were made larger due to much public criticism. Most people said that the Liberty dollars were too small and easy to loose. Therefore the new coins had to be considerably thinner and larger in diameter than the Liberty Dollars. These gold coins are 15% larger in diameter than the Liberty type was in earlier years. Type 2 dollars were easier to keep track of and less likely to get lost than the coins before them. Its obverse features a left-facing portrait of a female figure wearing an Indian headdress. The female figure is described as being an "Indian princess". Surrounding the portrait is the inscription "UNITED STATES OF AMERICA". The reverse design shows the date and denomination within a wreath of corn, cotton, wheat and tobacco. 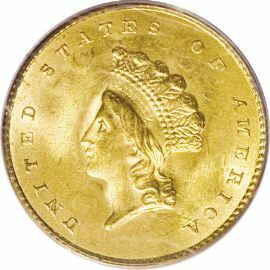 Longacre copied it after the reverse of the three dollar gold which he designed as well.